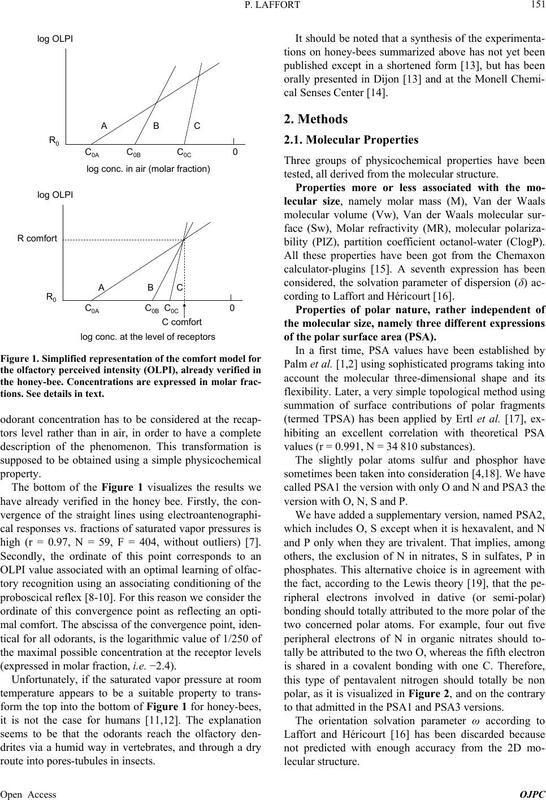 (molar refraction and Van der Waals molecular volume). This phenomenon can be apprehended in the Figure 1.
tions. See details in text. high (r = 0.97, N = 59, F = 404, without outliers) . (expressed in molar fraction, i.e. −2.4). route into pores-tubules in insects. tested, all derived from the molecular structure. bility (PIZ), partition coefficient octanol-water (ClogP). cording to Laffort and Héricourt . 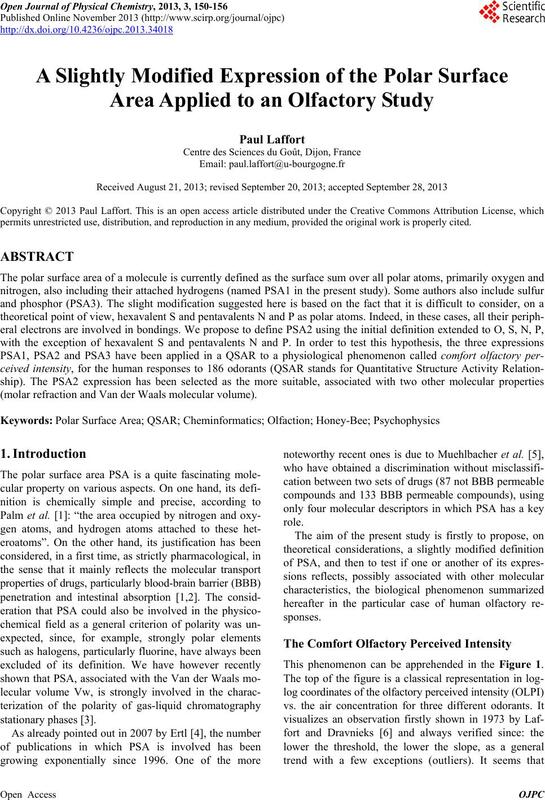 of the polar surface area (PSA). values (r = 0.991, N = 34 810 substances). version with O, N, S and P.
to that admitted in the PSA1 and PSA3 versions. whereas each oxygen has two pairs). to Abraham and co-authors [20,21]. 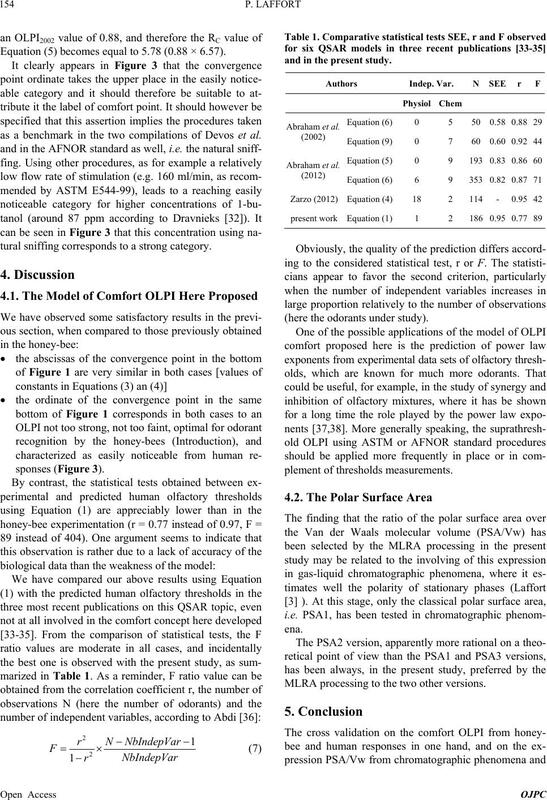 2011 by Van Gemert  and concerns 1150 odorants. each author’s results. Applying this method, Devos et al. power law exponents in air. that of power law exponents according to Devos et al. nia, i.e. NH4OH in aqueous solution). tial F ratios corresponding to each term. water), very popular in pharmacology. level, not too faint, not too strong. 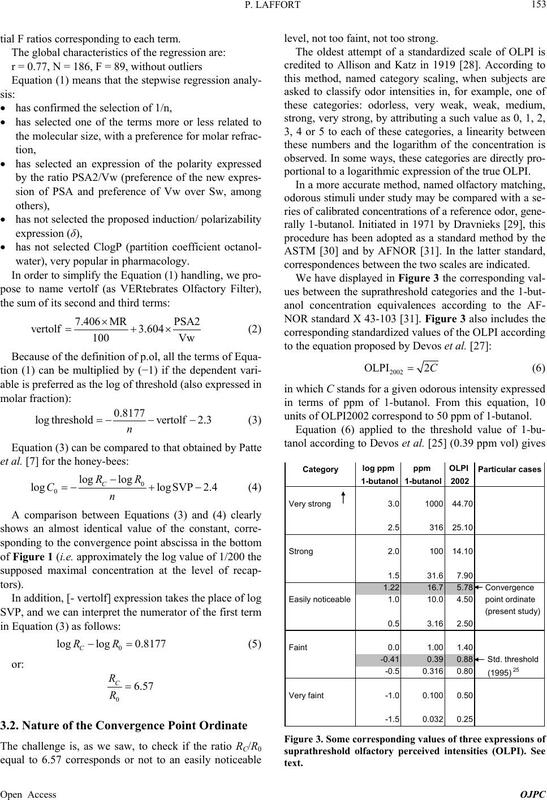 portional to a logarithmic expression of the true OLPI. correspondences between the two scales are indicated. units of OLPI2002 correspond to 50 ppm of 1-butanol. Equation (5) becomes equal to 5.78 (0.88 × 6.57). as a benchmark in the two compilations of Devos et al. tural sniffing corresponds to a strong category. and in the present study. (here the odorants under study). MLRA processing to the two other versions. you so much to all! ences, Vol. 85, No. 1, 1996, pp. 32-39.
search, Vol. 14, No. 5, 1997, pp. 568-571.
of Chromatography A, Vol. 1218, No. 26, 2011, pp. Vol. 38, No. 2, 1973, pp. 335-345.
siology, Vol. 35, No. 9, 1989, pp. 667-675. 35, No. 12, 1989, pp. 949-955.
vior Biology, University of Paris, 1990. Bourgogne, Dijon, 1998, pp. 579-584. 2001, Monell Chemical Senses Centre, Philadelphia. nal, Vol. 2, 2008, pp. 22-31.
try, Vol. 43, No. 20, 2000, pp. 3714-3717. 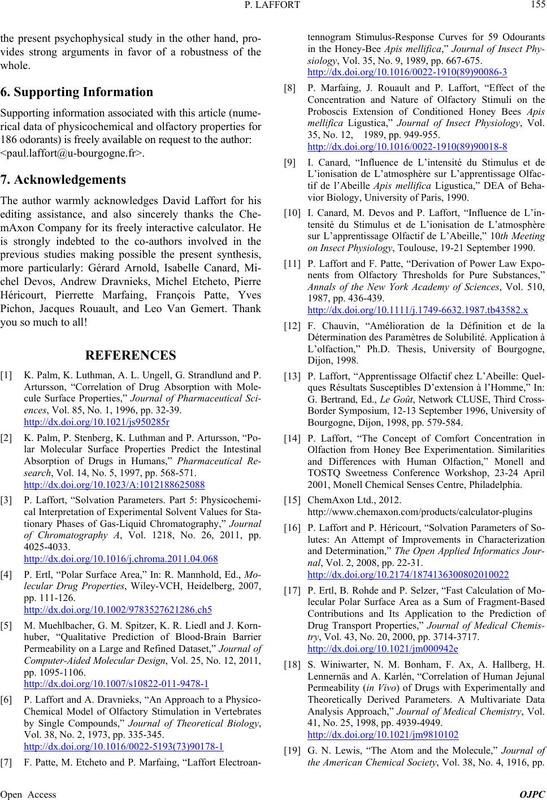 S. Winiwarter, N. M. Bonham, F. Ax, A. Hallberg, H.
Analysis Approach,” Journal of Medical Chemistry, Vol. 41, No. 25, 1998, pp. 4939-4949.
the American Chemical Society, Vol. 38, No. 4, 1916, pp. Vol. 22, No. 2, 1993, pp. 73-83. Vol. 42, No. 6, 2002, pp. 1320-1331. & Partners BV, Zeist, 2011. Physiologiques, Vol. 17, 1963, pp. 75-105. 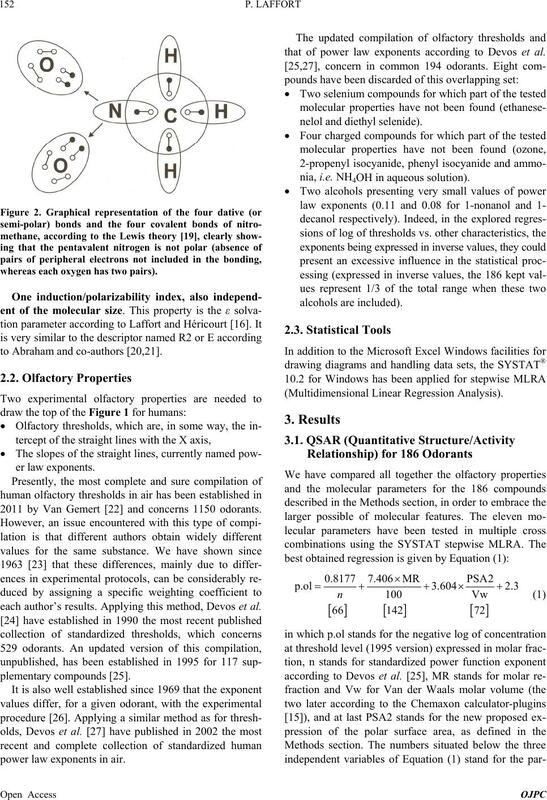 Air,” IRL Press, Oxford, 1990.
published Updating of the 1990 Version, 1995.
physics, Vol. 6, No. 6, 1969, pp. 349-354.
sitaires de Dijon, Dijon, 2002. 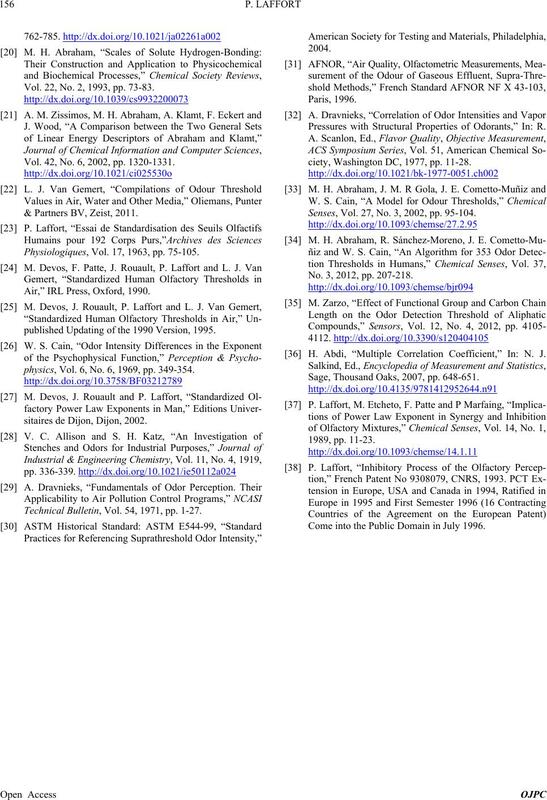 Structural Properties of Odorants,” In: R.
Technical Bulletin, Vol. 54, 1971, pp. 1-27.
ciety, Washington DC, 1977, pp. 11-28. Senses, Vol. 27, No. 3, 2002, pp. 95-104. M. H. Abraham, R. Sánchez-Moreno, J. E.
No. 3, 2012, pp. 207-218. H. Abdi, “Multiple Correlation Coefficient,” In: N. J.
Sage, Thousand Oaks, 2007, pp. 648-651. Come into the Public Domain in July 1996.